The Bureau of Land Management currently has 48,000 to 50,000 horses and burros in captivity, held in ‘holding pens’ classified as both ‘short term’ and ‘long term’ throughout the country. Roundups are continuing with burros also a constant focus. Advocates for both horses and burros question the purpose of continuing roundups with so many already languishing in captivity. BLM adoption rates are absolutely dismal: just 3% of these horses ever being adopted. Critics cite many reasons for this but the fact that citizens are discouraged from visiting the long term holding pens ranks top among them. The purpose of the Wild Horse Project is to see these animals placed in homes or sent to sanctuaries where they will be able to live out their lives in regions suitable as a natural habitat for those displaced by cattlemen, field work for energy companies, the U.S. Forest Service or the Bureau of Land Management. Our focus and goal is to raise awareness of the plight of these animals: To assist in making adoption an easier process for those that actually seek to provide homes for them and to provide access to those able to assist in the process no matter where in the country the adopters might live. We are providing hotline accessibility for both the BLM and potential adopters to utilize so that timely information is readily available — and a billboard campaign to bring new players to the table. For too long these animals have been suffering in silence — unable to provide for themselves an escape from their nightmare existence, separated from those familial herds with which they’ve bonded over the years and left to live out their days depressed and miserable, often without so much as protection from the elements. Winter finds them standing without windbreaks or shelter from subzero temperatures, wind and falling snow. Sizzling summer heat without benefit of shelter leaves them standing in blazing temperatures that often cause heat stroke and death. Were citizens to treat their companion animals in this manner they would be criminally charged and their animals would — rightfully — be removed from their ‘care’. Why are these government agencies allowed to operate in a manner that, for all appearances, would seem to be ‘above the law’? 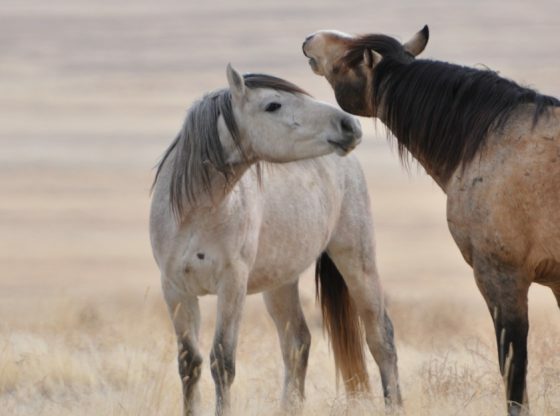 Wild horses have families and relationships similar to our own. They are among those sentient beings that can and will grieve themselves to death following separation from those they love. The least we can do is work with those that care to provide homes for them and assist in the adoption process so that they can find some semblance of peace, following their permanent removal from their herd families and facing a bleak future where they can never be reunited with those they love. Instead, the form of government under which they suffered during the last administration [yes, Obama — and Ken Salazar and Sally Jewell] saw them abused and then sent to slaughter. We understand that many people cannot bear to watch slaughter videos. They are absolutely horrific. No reasonable nation would do such a thing to sentient beings for any reason and, if the truth were known, their meat is not safe for human or animal consumption rendering the entire process entirely without benefit to anyone but the killers and those who facilitate them. Surely, under a new administration that has shown themselves to have a conscience, we can seek and find a better way to ‘manage’ America’s horses. Surveys have repeatedly shown that Americans, after all, are OPPOSED TO HORSE SLAUGHTER IN ANY FORM. If not, then every politician involved in any way in the facilitation of the destruction of these animals should lose their position as a spokesperson for their constituents and someone reasonable, professional and decent should be elected in their place. Equine Slaughter was banned in the U.S. in 2007. Since that time, a network of ‘kill pens’ — livestock ‘sale barns’ that function as pipelines to slaughter facilities have sprung up throughout the country, causing virtually ALL equines sold for ANY reason to face the prospect of being shipped across our borders to Canada or Mexico where the actual slaughter facilities operate, killing America’s equines for profit. It’s a dirty business, operating just outside the purview of those who would seek to stop them. Rescuers complain that they seemingly operate ‘above the law’ and that the actions and activities of the killers often facilitated by the very agricultural agencies tasked with the care and protection of the animals. The slaughter process itself is terrifying and torturous — a brutal ordeal that has left some of those with the strongest constitutions emotionally devastated by having watched the process. Equine aficionados from virtually every walk of life criticize the fact that the kill pen operators cater to kill buyers while penalizing rescue operations. In most of these places, only kill buyers are granted access to the facilities while rescue operators are left to follow the sales in online forums where the ‘virtual’ sale barn experience is very poor quality video of horses being kicked, poked and prodded to move for less than a moment in the hope that they will get a clear picture of the horses they rescue. Many horses never get even this brief window to escape the grasp of the kill pens — they’re directly shipped to slaughter after having been hidden away for whatever reason — perhaps they’re victims of animosity between people or they are marked or branded in such a way as to be instantly identifiable to those who might be searching for them. Whatever the cause, this is the plight of most. Most of the horses arriving at kill pens will leave there bound for slaughter with no chance at survival. For those fortunate enough to find their way into rescue, there can be a new life where they can be rehomed and, perhaps, retrained to find new purpose in life. This takes the effort of a team. 2. A Moratorium on Round Ups of Wild Horses and Burros until an adequate and accurate count can be obtained and a plan for their proper long term can be drafted. This does not include life in a long term holding pen. 3. A Plan to Establish Sanctuaries for Horses and Burros where they can live out their lives in peace. We believe in total and complete transparency. On our pages, you will find a page dedicated for each horse that is in imminent danger. Tattoos, brands and any identifying marks on these horses will be photographed and shared, along with the number assigned to them at the kill pen facilities. Their actual price, set by the kill pens, will be posted along with any veterinary fees added to their ‘price’. Depending upon their locations, a properly operated QT [Quarantine] facility and the amount charged per rescue will also be noted. Any transport fee the horse will incur will also be noted. Finally, transport people who specialize in equine transport will be listed so that people can find a transporter to bring their horses to them. 3. GUARANTEE that HOOFPRINTS.ORG will provide professional assistance, trade or rehome any horse with which the adopter is dissatisfied FOR ANY REASON and WITHOUT EXCEPTION. It is our belief that animals should be treated with love and compassion. We will rescue any horse in need at any time and we have a growing network of volunteers coast to coast. If YOU know of a horse that is in need of a new home for any reason whatsoever, please contact and notify us so that assistance can be offered. Our telephones are answered 24/7 and our passion is rescuing America’s equines — both horses and burros. It is imperative that we be contacted before the animals are placed into harms way — but if they’re already injured or ill, old or incapacitated, we will STILL INTERVENE on their behalf and work on their behalf. We WILL do things other facilities cannot offer such as taking horses temporarily while families struggle with difficult situations. It is our GOAL to ease the suffering of equines throughout our country. Whether you have a horse facility or simply a desire to assist, a passion for horses or even just a dream to learn more, we want to hear from you. There are many opportunities in this growing field and a person passionate about horses has the beginnings of a lifelong endeavor that will, truly, make them better human beings over their lifetimes. You need not ride or even possess horses to gain insight into this most profound companion animal — some of those who love them most do so from afar. Breakthroughs in medicinal applications using equine assisted therapy have shown that simply spending time with them is enough. Horses are natural healers! We are here to educate, inform, enlighten and assist those that share our undying devotion to one of God’s most resilient, amazing and wonderful creatures. You are sure to find friends here.